If you see 'DRMO' in the options it means the flight suit is stamped DRMO which means that it will not be allowed for turn in. We have discounted these further. Additionally, if the velcro is worn but the flight suit is otherwise in good shape this will be specified in the options menu as well, and will also be discounted further. 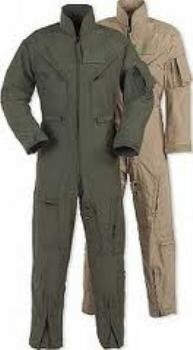 These CWU-27/P Flight Suits are purchased directly from the United States Military and they all have their appropriate NSN # (different for every size) and contract number (different for every batch ordered by the US Gov to each contracted manufacturer). In other words, these are not knock offs, and are not copies, they are the real deal for a fantastic price. In your shopping cart choose either New, Near New or Used, specify size and color (Olive Drab, or Tan). New CWU-27/P have never been worn or used, there will be no rank, name tapes or unit patches. All our gear is bought directly from the military so some of our new gear has been issued but when we list it as new it has not been used and this is clear by viewing the condition. Near New will obviously never have been worn or used but was issued and rank might be on, when this is the case we will list the item as Near New and report the rank. On some new flight suits the velcro will be sewn on the right and left breast in preparation for unit patches and name tapes. Used CWU-27/P have been worn, issued and will show some evidence of this. There will be NO holes, rips or tear, NO oppressive permanent stains (though the garment may need laundering). ALL zippers, velcro, snaps and buttons will be in excellent functional working condition. There may be a name tape, or evidence of a name tape having been sewn on, and/or rank and unit patches as well. Expect used condition from Glenn's Army Surplus to be in wearable, working condition to the high standards of the US Military. If you don't see you size drop us a note, it is possible that we have your size in our retail store and are most happy to check for you. If we show your size online, trust it, we take pride in maintaining accurate inventory. New & Near/New: $69.95! Used $49.00! 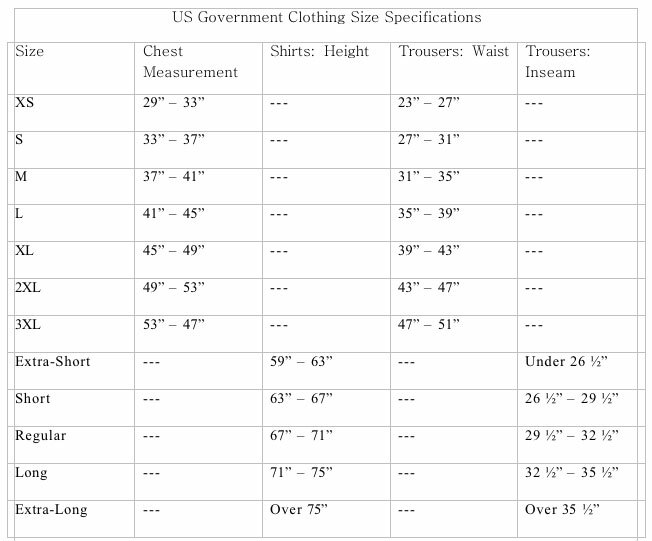 Regarding Size: Flight suits and coveralls in the US Military are CHEST measurements, not waist measurement. Order the same size you would for a blouse/top.